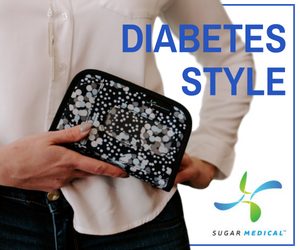 One of the challenges of using diabetes technology, such as an insulin pump or continuous glucose monitor (CGM) is carrying the device with you. For those using a pump with tubing, you need someplace to clip or hold the pump. 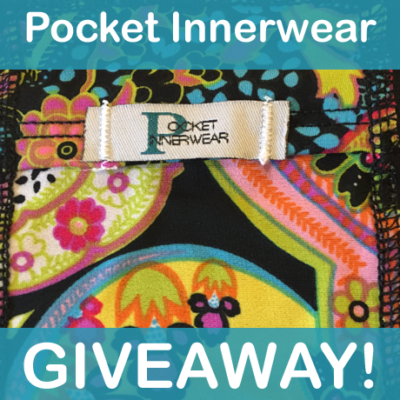 Pocket Innerwear has offered a solution in their T1D Techwear. 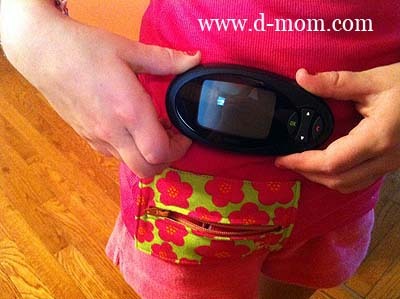 I know Q doesn’t always have a pocket or a belt loop to attach her CGM receiver. 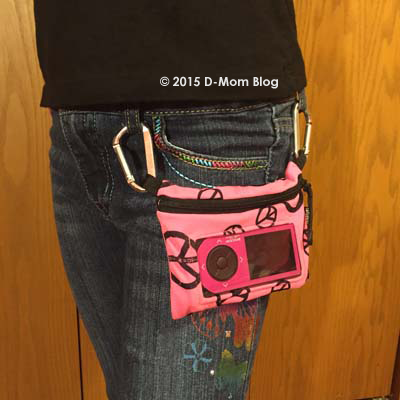 And as she’s gotten older, she has wanted to wear a waist pouch less and less. 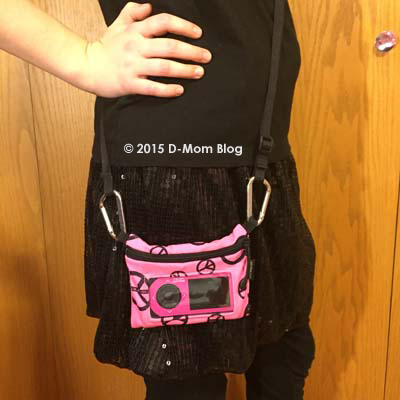 Sometimes she clips it to her supply bag (a purse she carries), but there are times during activities that she just needs the receiver on her and doesn’t have anyplace to keep it. What I like about the T1D Techwear tanks is that they can be worn as a layer (or by themselves!) and they just look like any other layer of clothing. This summer the company sent us a new tank, great because Q has outgrown the one she had been wearing. 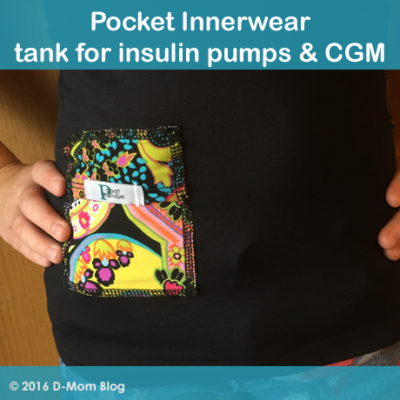 Q chose the “Summer Special T1D TechTank” which has two cute paisley pockets. If you want a layer that’s more inconspicuous, they also offer styles with pockets that match the color of the tank, for instance white or black. They have styles for kids, men, and women including tanks and briefs. 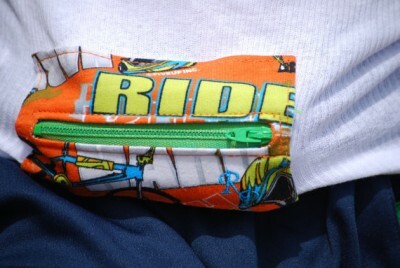 And if you have a tubed pump, the pockets have a hidden buttonhole for the tubing. Sierra Sandison wearing “The Drop” hat. 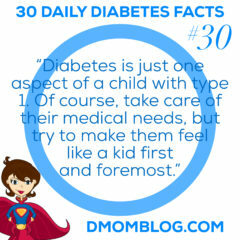 Image courtesy Beyond Type 1. Beyond Type 1 was founded earlier in 2015 by two d-moms, Juliet Baubiny and Sarah Lucas, and by celebrities Nick Jonas and Sam Talbot, who both live with type 1. I’ve been following Beyond Type 1 on Instagram where they share a daily image and story about someone living with type 1. 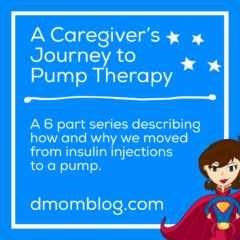 They ask “How do you live beyond?” Some of the best answers come from the littlest of T1’s such as Eddy who answered “by going down the tallest slides.” Your child with diabetes can be featured by submitting their story through their website. Another one of their campaigns is “The Drop Spotted” campaign. 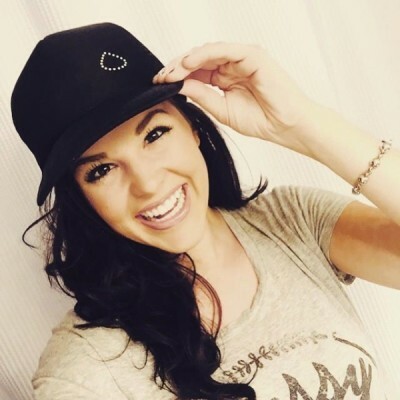 Celebrities have been seen wearing their signature black hat with white blood drop, such as Sierra Sandison of #showmeyourpump fame. The “Drop” hat can be ordered from their website and then you can share a photo tagging it with @beyondtype1 and #TheDropSpotted. 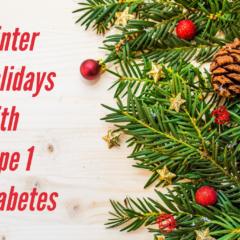 We haven’t had a chance to take a photo of Q wearing the hat yet, but I was anxious to share information with you about Beyond Type 1 and their two social media campaigns, given that it’s Diabetes Awareness Month. The group is also raising $1 million, one dollar at a time, something that I am sure can happen given the fan base and celebrity of Jonas and Talbot. Plus I just really appreciate, with all the negative attention that diabetes often gets, how upbeat and positive Beyond Type 1 is. I’ve even learned a thing or two, including that one of my favorite actors Victor Garber lives with type 1. Founded in February 2015, Beyond Type 1 seeks to bring a new level of respect, understanding and support for those living with type 1 diabetes. Our goal is to highlight the brilliance of those fighting this disease every day while always working toward ensuring a cure is on its way. By establishing a supportive community via powerful social media people are connected on a global scale in a new way. Our Instagram campaign “Living Beyond,” showcases the age, range and variance of those living their best life with T1D, and our website and social media platforms provide education and support. High profile collaborations and carefully curated special events will provide education and awareness, affording a greater capacity for strategic fundraising. Because our Founders + Founding Friends pay all operational and fundraising expenses, 100% of every dollar raised directly supports the most promising global efforts and programs working to educate, advocate and cure type 1 diabetes. 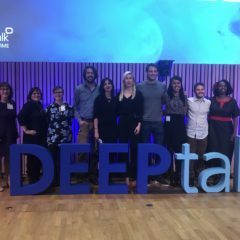 We aim to be provocative, inclusive and disruptive: putting a face on this disease, clearing up misunderstandings about who is affected by T1D and eradicating the stigma that comes from living with a chronic disease. We recognize there is a different narrative to be told: that of a strong empowered community living a powerful life beyond the diagnosis. We also recognize a future free of T1D is possible and we are here to make certain that future materializes. We are here to disrupt diabetes. Disclosure: Beyond Type 1 provided us with a Drop hat. Monetary compensation was not received for this post and opinions are my own. Please read my disclosure statement. 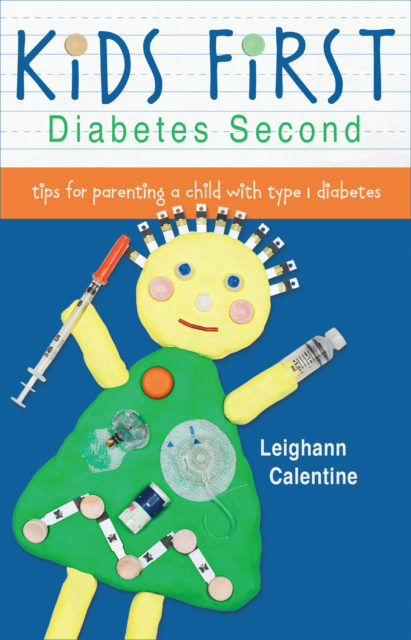 Join me every day this week as I highlight diabetes-related products we’ve tried out this summer. 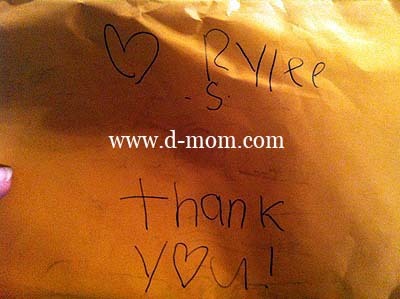 Read more D-Mom Tested product reviews. These two images are courtesy Rylee’s Pocket. I was on Facebook one day and saw a link to the Rylee’s Pocket page. Since Q has recently started using a CGM, I’m on the lookout for options to carry the receiver. 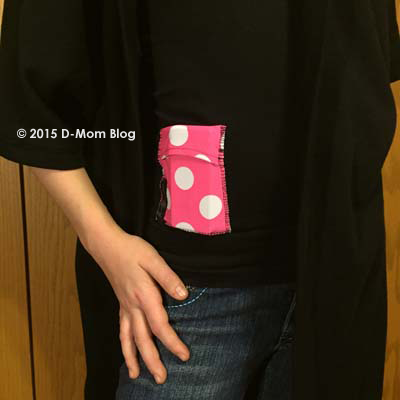 The Rylee’s Pocket tanks come in different colors (for BOTH girls AND boys and adults, I might add) and feature a small pocket sewn near the bottom. At first glance it looks like its just a styling detail, but unzip the zipper and lo and behold it holds an insulin pump! What’s cool is that if you wear a traditional tubed pump, there is a button hole on the underside through which you can route your tubing. No one even has to see it. We use the OmniPod, which has no tubing, so that’s not an issue for us. But I asked them if they thought the DexCom receiver would fit. She gave me the dimensions and in the spirit of market research we gave it a try. 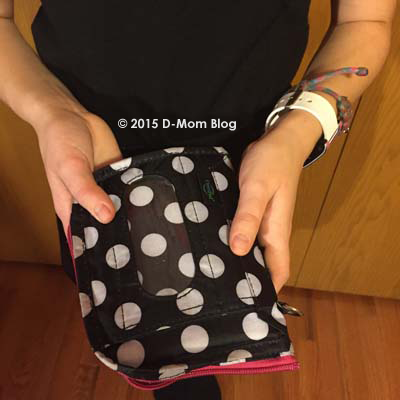 For us, the DexCom receiver fit just fine. It fits snugly, but we can get it in and then just unzip to look at the screen and press the buttons. The tank was a Cherokee that had been modified. And Q may or may not have worn her bright pink Rylee’s Pocket tank after receiving it in the afternoon mail, to bed, and the entire next day until I pried it off of her and insisted she throw it in the laundry hamper. I love that we’ve found another option for carrying the receiver. And I know you are thinking that it’s almost fall and why would you want a tank. Layers, baby! 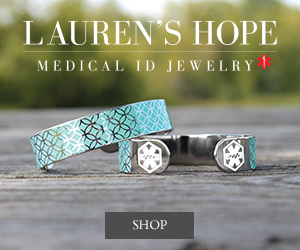 They were even recently featured in a CNN article “Physically challenged and fashionable.” One of their goals is to make enough sales to donate tanks to a local diabetes camp. Visit the Rylee’s Pocket website, find them on Facebook, and purchase from their Etsy site. 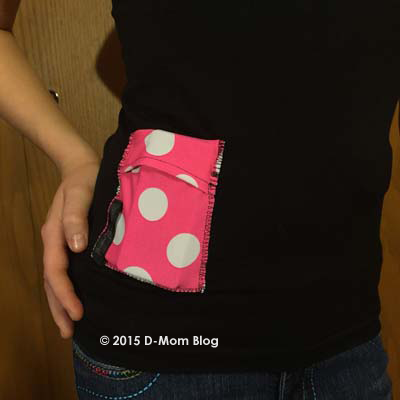 Disclosure: Rylee’s Pocket provided us with this top for review consideration. Monetary compensation was not received and opinions are my own. Please read my disclosure statement.